""Thanks to Alpha Anywhere, we built a comprehensive system spanning countries and departments that has saved us time and money, lets us operate more efficiently, and improves our relationship with our customers." Improve productivity by replacing an ad-hoc voice/instant messaging communications system with one that helped staff more accurately dispatch and manage work assignments. Give database access to field teams so they can get site and asset information, inventory availability, work requirements, and work history rapidly and dependably. Relieve the back-office workload by allowing data to be accurately captured in the field. The Company believed this would greatly improve efficiency and data accuracy because data would be captured by the staff doing the work onsite in the field, not by supervisors in a different location, hours or days after the site visit. Improve reporting accuracy and reduce time required to prepare reports by consolidating all field activity data in a central database with easy-to-use analytics capabilities. Improve customer service by providing real-time status updates, instead of taking hours or days to collect and consolidate data requested by customers about activities in the field. "Alpha Anywhere ticked all the boxes. It offered numerous out-of-the-box advantages, of which offline-capability on mobile devices was the most significant --- most other platforms didn't have that capability built-in." Hayat Communications created a document outlining the system's requirements based on a comprehensive audit of requirements by multiple departments and current projects in all the countries in which the business operates. Based on the document and additional research, Hayat decided to develop the solution itself, using a Rapid Mobile Application Development (RMAD) platform. It compared RMAD solutions from a number of vendors and found that Alpha Anywhere was the best suited for the project. "Alpha Anywhere ticked all the boxes," says Nikos Kazantzis, Group Head of Systems Integration for Hayat Communications. "It offered numerous out-of-the-box advantages, of which offline-capability on mobile devices was the most significant --- most other platforms didn't have that capability built-in." Kazantzis adds that two other elements made Alpha Anywhere stand out: It offered end-to-end development capability (including server, client, mobile, and database), and it would allow Hayat to build a significant amount of the platform using GUI-based tools with little or no coding. Hayat had outside expert developers build and test core components, business logic and functions, but most other work was built by Hayat staff using Alpha Anywhere. "Having us work this way put immense power in our hands, because we had many different project requirements in different countries and regions," Kazantzis says. "With Alpha Anywhere, we could quickly adapt to specific needs in each geographic area." Development went quickly. 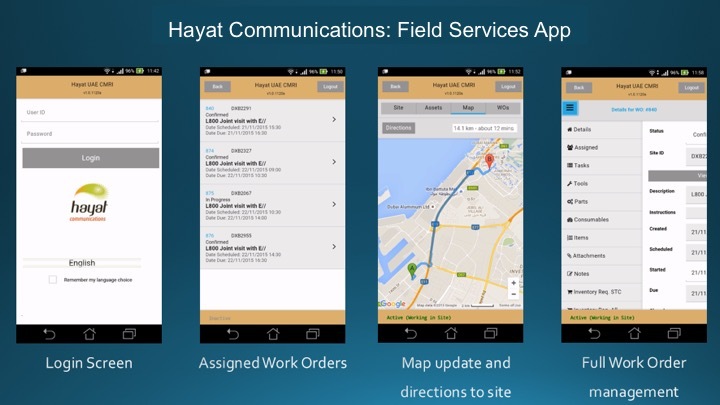 Within the first month, Hayat had built its first demo, including a mobile app, for a major fixed/wireless network operator. Within six months, the system was operational across more than 6,000 sites with 300 users. Six months after that, the system had doubled in size. "We couldn't have built something this large and sophisticated this quickly with any other platform," Kazantzis says. "It was a tremendous time-saver, and let us build exactly the solution we had envisioned." "With Alpha Anywhere, we built an enterprise-wide system that spans multiple countries, and encompasses thousands of sites and users. We developed a full end-to-end system including servers, clients, mobile, and databases, with offline capabilities, more quickly and at less cost than if we had used another system." With Alpha Anywhere-created CMRI, Hayat has gained significant benefits, including increased productivity, improved dispatching and field management, increased accuracy, and better customer service. Hayat also saved significantly on licensing costs. "With Alpha Anywhere our cost was not directly dependent on the number our users or sites," Kazantzis says. "Typically, software vendors in our sector charge ‘per user' or ‘per site' license fees, and sometimes both. Because Alpha Software doesn't charge that way, we saved a tremendous amount of money, particularly as we expand its use." With CMRI, work is assigned, managed and logged through one system, instead of multiple ones as was done previously. Accessing data, all the way from a single work order up to a global summary takes only a few mouse clicks. Anyone with the right permissions can access part or all of the data and reports instantly. Previously, getting a daily report took hours, and had involved all department heads. Unnecessary phone calls and instant messages have been minimized – only emergencies now require calling. Because field users update their status on a live basis, the company now better knows the status of its work in the field. Workers spend less idle time because people are assigned to work according to live metrics, leading to improved productivity. Customer service and customer relationships have been dramatically improved. Customer requests are answered on the spot, and customers can see the location of field crews. Customers can also see all the data about work done by Hayat on their jobs, including time-stamps for when work was done. "Thanks to Alpha Anywhere, we built a comprehensive system spanning countries and departments that has saved us time and money, lets us operate more efficiently, and improves our relationship with our customers."